Anakin was one of only three movie figures to have original artwork used instead of a character photo or movie image. You can't tell by this photo but there is actually a darkened forest in the background. That part is usually cut off from the card photos although the POTF carded figure shows more of the image than the Tri-logo carded version. 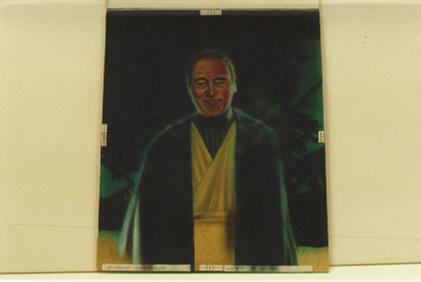 This image shows Anakin Skywalker in his more "spiritual" form and is quite a nice rendering of the actor, Sebastian Shaw. This artwork was also featured in the Star Wars Galaxy Series 2 card set as card #200.